The Hearing Health Foundation (HHF) unveiled today a new microsite dedicated to Ménière's disease, a chronic vestibular (inner ear) condition with no known cure. The content is accessible at www.menieresdisease.org as an extension of the foundation’s primary website, www.hhf.org. Nicolle is one of the 600,000 people in the U.S. affected by Ménière's disease. The most prominent symptoms include a sensation of ear fullness, dizziness, vertigo, nausea, fluctuating hearing loss, and tinnitus. She has been using her art to help people be open about their conditions and find treatments and relief and know that they are not alone in this journey. For this reason, Nicolle has teamed up with the Hearing Health Foundation to continue to raise awareness about this illness. YOUR SUPPORT BRINGS US CLOSER TO FINDING CURES FOR MÉNIÈRE'S DISEASE. VeDA selected 'Balance Warrior' as the centerpiece of 2018's Balance Awareness Week campaign. This artwork is currently featured on their poster and other items available on VeDA's website as part of a comprehensive fundraising campaign––100% of the proceeds of the sales will go to supporting this wonderful organization. Nicolle holds VeDA dear to her heart because of the wonderful work they do for vestibular patients suffering a wide variety of vestibular disorders. VeDA is also an excellent resource for vestibular patients, their families, researchers, and medical doctors. VeDA's site is a digital library as well as a safe space for webinars and online support groups. 'Balance Warrior' is a small mixed-media painting that belongs to The Colors of Sound Series. It was created by Nicolle during a time when she was experiencing severe vertigo episodes, almost daily. It was very difficult to paint, or just to stay awake / function, but she managed to use art as her coping mechanism and continues to spread awareness by sharing her art and her story. To purchase Balance Awareness Week (BAW) merchandise, click here. To learn more about vestibular disorders, click here. Project DALE invited Nicolle to share her story as an artist and an immigrant with a group of 10 students who visited from New Jersey. Project DALE's mission is to create and nurture a space and community where our youth can grow, discover, and learn through the power of the Arts. Nicolle discussed the creative process of The Colors of Sound, her latest art collection inspired by her recent hearing loss. She also talked about how she has used art as part of her own recovery process. Nicolle also held an art workshop where different art activities and techniques were explained. Students created individual paintings based on an exercise where they explored personal strong emotions. A large canvas was also painted as part of a collective experiment where students, instructors, and Project DALE founder interacted. Special thanks to Danielle Dubuc from Be Strong International, who also joined the event and gave a talk about empowerment and resilience. The Wild Art. Beautiful Life Exhibit & Fundraiser took place at Wynwood Blank Canvas during the week of Art Basel 2015. The event was well-received by the local and international art collectors who attended. Nicolle's sculpture titled "COMPASSION" was auctioned during the grand opening evening and 100% of the profits were donated to the U.S. Humane Society South Florida Chapter to benefit several animal rescue initiatives. It was a wonderful evening filled with great entertainment, art aficionados, and animal lovers. The FIU Herbert Wertheim College of Medicine, presented the work of selected artists during the 2014 edition of the Mammography Art Inititiative. The inspiration for this year's show was the word STRENGTH. The 3rd Annual Art Show and Auction took place at the Frost Art Museum. 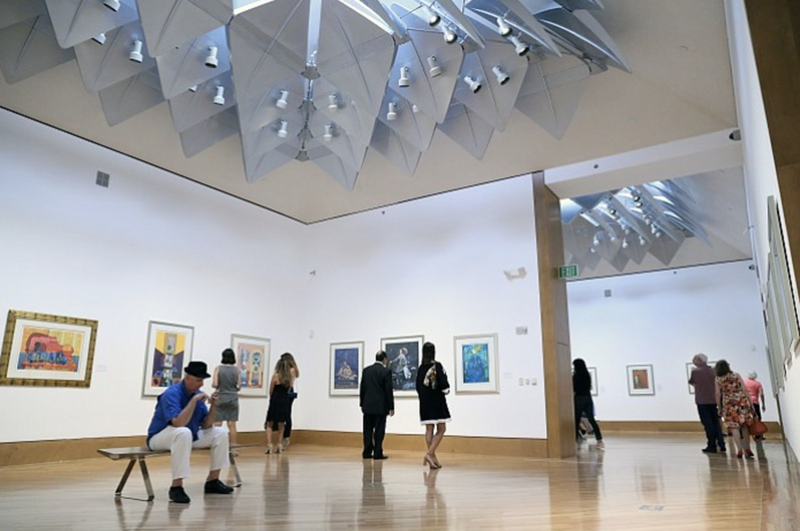 Through the fundraising efforts of these type of art shows, FIU has been able to raise over $50,000 in funds and services to sponsor mammograms and follow up care for hundreds of women all over South Florida. The goal of the Art of the Cure fundraiser, hosted by the Juvenile Diabetes Research Foundation, is to bring science and art together to fund and find a cure for type 1 diabetes. Nicolle's art was chosen to be auctioned during the 2012 gala at the Coral Gables Museum. Blossom of Dreams, acquired by MCM Engineers & Contractors, was auctioned during the Rally for Kids for Cancer Gala. All the profits of this sale were donated to the Jackson Memorial Foundation for Pediatric Cancer Research. "This piece was inspired by children and their imaginings. While human souls are fully developed from the beginning; each of our dreams, thoughts, and desires start evolving as we experience the world. Children's dreams are like floating seeds in the air, waiting for the right time to blossom into their own colorful reality. Each vision filled with hope, romanticism, and joy." Nicolle Cure. *Mr. Raul Munilla, principal at MCM, Acquired BLOSSOM OF DREAMS During the Silect Auction. LA-based luxury tennis handbag brand Cortiglia selected a group of 6 international artists to create 3 custom-made designs each. These exclusive creations were commissioned for the Cortiglia Art Basel 2015 Collection. Each unique handbag was auctioned and sold in a private exhibit to support each artist's charity of choice. The proceeds of Nicolle's designs were donated to the non-profit organization Labs4Rescue.